It was one of those vivid reading experiences, the first time I read Terry Griggs. Last August, and I was sitting on a bench in a park in Elora Ontario, taking a sunny break in a lovely day’s outing. I was reading Issue 74 of Canadian Notes and Queries, the Salon Des Refuses Issue, and the story was a new one, “The Discovery of Honey”. First line: “My parents were married in a high wind that was conceived in the tropics and born in a jet stream.” And the whole of the story seemed to be impelled by that wind, by such a tremendous energy. In reading other stories by Terry Griggs since then, however, I have found that same energy ever-present. Coming from the words themselves, I think, her prose “a language landslide, an avalanche”. She uses language, which sounds obvious, but most writers don’t, not quite like this. Griggs’ new novel is Thought You Were Dead, her own particular take on the crime-fiction genre, and her 1990 Governor General’s Award-nominated collection of stories Quickening has just been reprinted as part of the Biblioasis Renditions Series. I’ve reviewed both books here. 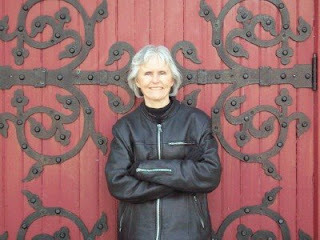 Terry Griggs was lovely enough to answer my questions by email from her home in Stratford Ontario. I: What has been your experience of crime fiction? Prior to Thought You Were Dead, were you an avid reader of it? What writers and books are you most familiar with? What are your thoughts on the genre? TG: Very little experience, really. Before starting research for Thought You Were Dead, I’d read maybe two or three mysteries. But at some point I became interested in the form and intrigued with its popularity, especially among readers who would not otherwise read genre fiction. I’m an Eng Lit grad, so for the longest time the only kind of work I read was literary. Not a lit-snob, just didn’t know any better, thought that’s where the good stuff was. And it is, of course, but certainly not all. I still think of literature as being in two categories, although for me it’s no longer the literary/ popular fiction divide, but basically what appeals and what doesn’t. Some books fulfill my reading needs and desires and others don’t—it’s as simple as that. I find this a satisfying re-arrangement of priorities and one that opens up the field. As for books: I discovered Ian Rankin’s Rebus series early on and followed along —to think that his publishers had wanted to dump him at one point before he hit the big time! I’ve read all of P.D. James and Martha Grimes, most of Elizabeth George, and sampled many others. Kate Atkinson I’ve always liked, and she’s written some mysteries of late (although I believe she doesn’t call them that). Haven’t delved much into the oldie-goldies yet, I confess, although Dan Wells, my publisher has just sent me a copy of Chandler’s The Little Sister. I: What did you learn about crime fiction while writing this novel? Though you’ve constructed a send-up of the genre, you’re still working within the formula. How was this experience different from your previous writing? TG: I feel that I’ve always written mysteries, just not the kind that come with the sort of conventions that need to receive at least a nod as one is passing through. And literary does have its own formulas, perhaps less obvious ones. I found the genre to be a fair bit of fun, the form flexible enough to sustain a bit of larky handling. Although this book comes out as a send-up, it’s really just creative play and me inhabiting the genre in my particular, albeit subversive, way, making it my own, leaving my thumb print (evidence!). Plot is perhaps more easily traceable in Thought You Were Dead than in some of my other works, although I’ve never considered it a lesser element. I want to be a good storyteller. I: I’m always interested in how writers name their characters, and names do seem to be a preoccupation in your work. Most particular, from where did you unearth a name like “Chellis Beith”? TG: You’re right about the preoccupation. The other night at a reading I was asked about where I’d found the name Chellis, and if I recall, I encountered it in my reading somewhere, possibly in a magazine. I tend to collect names, and sometimes suffer from name-envy if I run across a good one. Someone once told me that they’d named their daughter after a celeb’s kid that they read about in People or Cosmopolitan, I forget which, and I found this proud admission a wee bit sad (okay maybe I am a snob). So in Thought You Were Dead this is how Chel’s mother discovers his name, reading a trashy magazine while waiting in line at the grocery store. Here’s something funny, though: Chellis is an unusual name, but I did run across it again recently in The New Yorker. A woman called Chellis Glendinning has written a book, perhaps it’s an article, entitled “My Name is Chellis and I’m in Recovery from Western Civilization,” which sounds exactly like something my character would write. Now, his last name is actually borrowed from the town in Scotland where my own ancestral family came from before moving to Glasgow way back when. There’s a quiet little network of Scottish stuff in the book and Beith is one of many. And, by the way, you have a very interesting name—two Irish counties. Wouldn’t mind hearing the story behind that. I: The novel is packed with details, detritus from Chellis’ work as a literary researcher. (“The number of bones in the face (fourteen), the name of Sir Isaac Newton’s dog (Diamond)…”) Where did you get all this stuff? Had been saving it? Was it gathered specifically for this project? Do you require this kind of background yourself before you start writing, or can you just sit down with a blank page and go? ll “fact” even plays a significant part in the book. It’s much easier to find these now with Google, but what you mention I discovered in my own reference books. No, I don’t face the blank page without doing some foraging beforehand, finds which go into a notebook. Usually a couple of notebooks—one for straight research—for Thought You Were Dead, I checked out women inventors and genealogy, among other things—and one for words, ideas, proto-conversations, wordplay, chapter titles, whatever might seem useful. I: I loved your listing of Chellis and Elaine’s formative reading:. “Mad Magazine, or Archie comics, or PG Wodehouse, and she reading Popular Mechanics, Richie Rich comics, or Virginia Woolf.” Was your formative reading so diverse? What kind of thing did you spend summer afternoons reading out on your porch? TG: You know, I wasn’t a devoted reader. Or at least reading didn’t occupy a large part of my time, as it does with true bookworms. I did read those comics, piles of them, and the Alice books repeatedly, and Enid Blyton’s adventure series, other stuff long forgotten. Most of the classic children’s books I didn’t read until I was a young adult, and now do read fairly widely, but I have to say I’ve never tackled Popular Mechanics. I: Chellis notes that “Fiction filtered so surreptitiously into everyday life that you had to keep your eye on it. But not banish it altogether. That would be too too boring. Besides, it was so useful.” Has this been true in your own experience? Whether as a writer or simply a person living an everyday life? And would you, like Chellis’ employer, be annoyed at the terms “fiction” and “falsehood” used interchangeably? TG: Well, you think of your own family stories, or anecdotes of daily happenings, the rendering of which often enjoy improving tweaks—fiction is a great assist in making life more interesting. It gives a finer, improved shape to conversation. Not that it isn’t true. That trip to the dentist may simply become a funnier, more artfully delivered report—you mine the situation for its subtext, or its less obvious charms. We’re story-telling animals, after all. Falsehood strikes me as being more intentional, purposely deceptive. Fiction transposes life into art, whereas lies are all craft. I: I’ve thought a lot about how an author is meant to approach her readership, particularly because so many readers demand a pretty immediate kind of satisfaction from a book or a story. But in your foreword to Quickening, you suggest that any satisfaction seemingly withheld might just require the reader to work a bit harder. “If the gist of any particular effort here seems overly elusive, a reader might need to venture in like a beater and drive out the game.” This is a provocative stance to take, to make the reader work as hard as you do. Should reading not be entertainment, a kind of leisure? What are your thoughts on this? TG: I love the idea of being provocative, but that was actually said as a kind of courtesy. I’ve been given the impression that the stories can be tricky, not immediate, as you say. Can’t see it myself. An attentive reader is all that’s required. So, the statement is just me acknowledging that people bring other reading experiences to a story and perhaps mine may potentially cause a bit of head-scratching. I do think a reading workout is a good thing, forging new neural pathways, etc., but I also believe that entertainment and pleasure are the main reasons for reading. Some of us are just entertained by more tangled offerings. I: “A language landslide. An avalanche, out the words tumble slam bang, and razzle dazzle.” This from your story “Suddenly”, whose character’s words seem to “put on disguises before sneaking out of [her] mouth.” “Language landslide” or “avalanche” could also qualify as a description of your own prose. But does it really flow so easily from your pen? TG: Slowly. I write sloooowwwly. Fuss fuss fuss. But this is the interesting thing. The result, or so I’m told, has zip, a certain energy. Words are alive, after all, and possibly I’ve been able to align them in such a way that enables them take off at a real clip. I: Your story “The Man with the Axe” is much about the creation of fiction. “Two women talking, that’s all it took to spark a birth, a genesis, to entice someone out of the shadows.” Is this your experience? Where else does fiction come from? I: As a writer for whom language is so important, “finding the exact place the words met events”, it is remarkable that you so often take on the point of view of characters without language— the dogs, the babies, the fetuses. What is the appeal in this for you? Is it the challenge? And how do you find the right words to match such characters’ experiences? TG: Looking over some of what I’ve written, there appears to be two categories of the speechless. Or near speechless. Those who use language stupidly, cruelly, more as a weapon, and those, you mention, who are invested with emotion and smarts, but can’t express it. I’ve never analysed why I do this, but I assume it’s some presentation of how rich the medium—language—is, how difficult the access at times, or how easily abused. I’ve always been happy to grant sensibility to, well, just about anything. In the kids’ books it’s a fountain pen named Murray Sheaffer. Am a generous dispenser of human goods (and bads). Perhaps I’m a pantheist. People do this sort of thing with their pets all the time, I expect. You interpret a look or a quality and put words in the dog’s mouth to match. The cat says wonderfully astute or affectionate things to you in a cute voice you ascribe to her, whereas what she’s really thinking is how you’d be a tasty little snack if only you were more her size. I: What are your preoccupations as a writer? Are these different than they used to be? TG: My main concern is simply to write well, to improve, to keep things lively, and to have a good time doing it. All that has been consistent from the beginning. My fascination with language itself continues, and some subjects keep coming up: the male/female divide, what used to be called the battle of the sexes, and ambiguity—people in situations that they both want and don’t want. I: Who are your favourite writers? What are your favourite books? TG: I like the stylists mainly, and poets. So just off the top of my head: Vladimir Nabokov, Eric Ormsby, Hilary Mantel (new book out soon), Beryl Bainbridge, Ted Hughes, Seamus Heaney, Diane Johnson, Julian Barnes, Rose Tremain, Flann O’Brien, Martin Amis, Eva Ibbotson . . . oh lots lots. I: And finally, what are you reading right now? Great interview! I’m looking forward to reading Thought You Were Dead. I had a feeling you’d like that one, Kate. And I’m glad you enjoyed the interview. I’ve been eagerly awaiting this interview. It was wonderful! I am anxiously awaiting my read of Thought You Were Dead. I find Terry Griggs really inspiring. We are Running the Red Maple Program again at Hawthorn PS Mississauga. I have a student who is very interested in connecting via email with Ms. Griggs. This student wants more information about the villan in Nieve. It’s for a book review. I would be pleased as the teacher-librarian in the school, to be an intermediatry.